not a working gadget. The Google iGadget shows you the current moon phase, phase name, percent of full, and date, based on your local time and hemisphere. iGoogle was discontinued Nov 1, 2013 so this gadget is no longer available. However, you have other options. 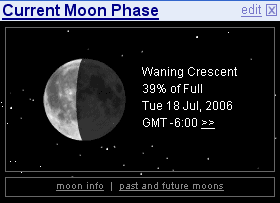 The gadget uses Flash for the central area (moon image and text). Install Flash plug-in for your browser at www.adobe.com. If you are seeing a blank area with a red "X", then you need to install Flash Player. Also, if the moon image does not seem to change (i.e., it may be stuck on the New Moon), that is also an indication you need to update your Flash Player. If all else fails, you may need to completely uninstall Flash Player, and then reinstall it again. If the date display is wrong or the calculation or phase seems wrong, please check your computer system date and time. Why? Because the Gadget calculates the moon phase based on YOUR time zone and time. You can use the "edit" link (update: Google now shows it as an arrow) to edit settings. The moon is shown by default for people living in the Northern Hemisphere, but you can change it to a Southern Hemisphere viewpoint. The bottom box area -- where the image above shows "moon info" and "past and future moons" -- may change. It is a communication and resource box for important notices, news, etc, from us. If you have a question not answered above, or a comment, contact us here. Also let us know if you are experiencing any technical trouble.